© 2017 Magic Lamp Dance Studio. Magic Lamp Dance Studio has been providing quality belly dance instruction since we opened our doors in 2008. We strive to foster an atmosphere of fun, fitness and fellowship, teaching the basics of belly dance in a non-competitive environment in our Level 1 classes. Magic Lamp Dance Studio's Level 2 classes offer more of a challenge for those who are familiar with the basics of belly dance. 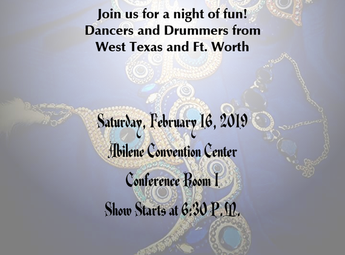 In addition to dance classes, Magic Lamp Dance Studio hosts a monthly Middle Eastern Drumming class taught by a master instructor from Ft. Worth. We also offer group or solo performances tailored to meet your needs. Come take a class with us or hire a belly dancer to perform at your next party or special event! If you have any questions about dance or drum classes or want to visit with us about a performance, send us a quick note using the form to the right or call us anytime at (325) 439-0037. Like us on Facebook to keep up with events!